This vessel replaced another vessel from the 1800s, which became a museum. 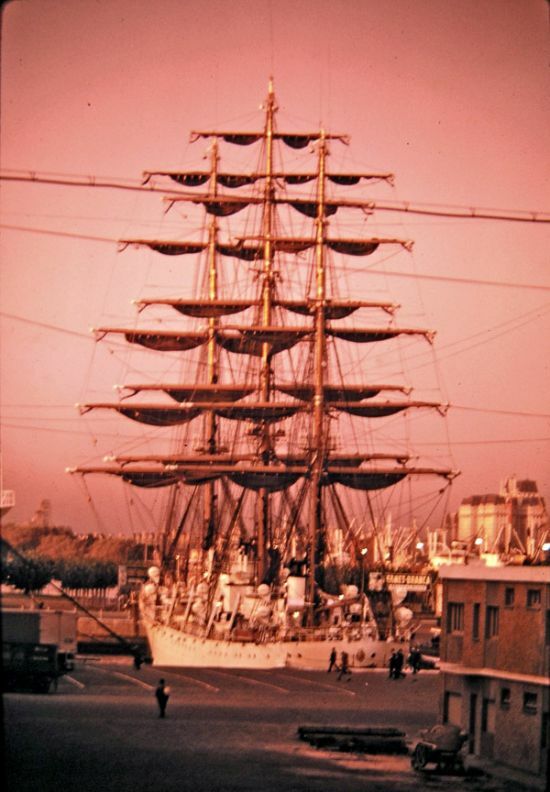 I believe it was named the Libertad. I did a search but didn´t find the information. This picture of the Jeanne D´Arc was a real challenge. 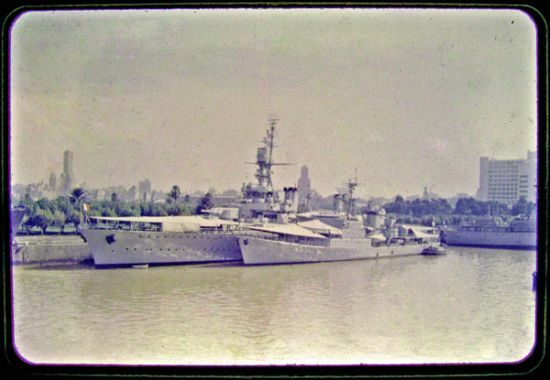 I took the picture while a cadet myself, 1960-61, and not very good with a camera. I would guess that the ship is a light cruiser, but may be wrong. It seems a bit light in firepower. Got a good close-up view. 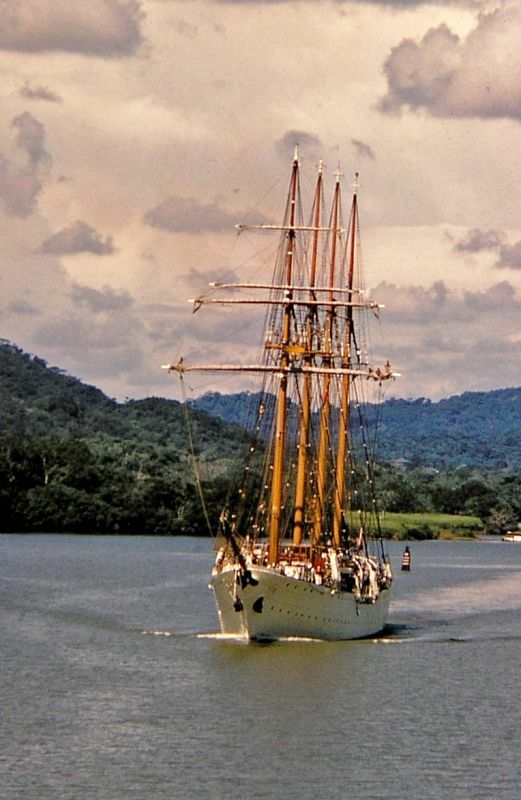 Bahia, Brazil- I used to see this boat every morning, making a trip across the bay with some sort of cargo. It probably provided a living for the family that ran it. The mast interested me. 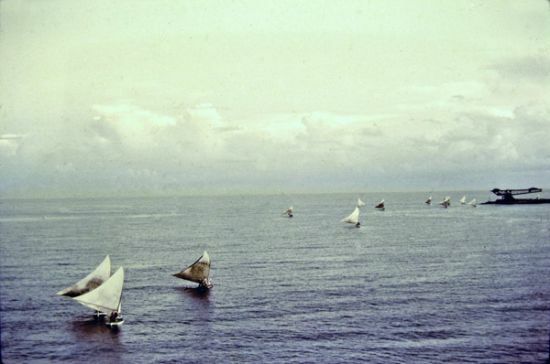 It looks a little like those on the pre-war "S" Boats, an old racing class. 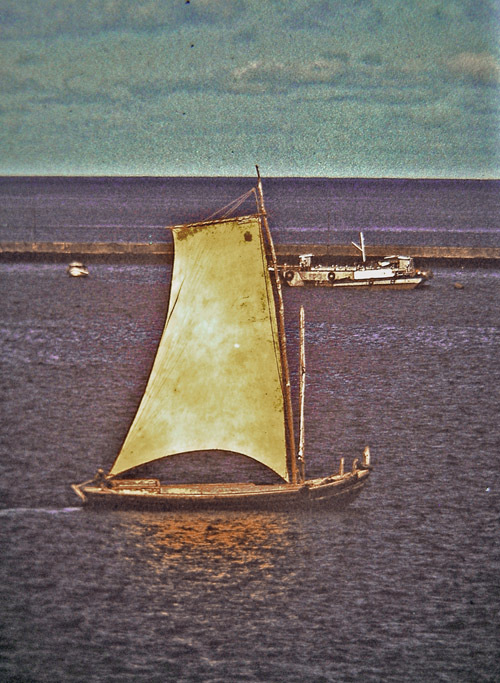 Note the loose-footed sail with the boom behind it. This tiny island with its lighthouse is at a turning point when entering the Persian Gulf. I was lucky to get a picture of it on a clear day. The Captain told me to take a good look because the dust storms usually obscured it. Later trips in the area proved him right. 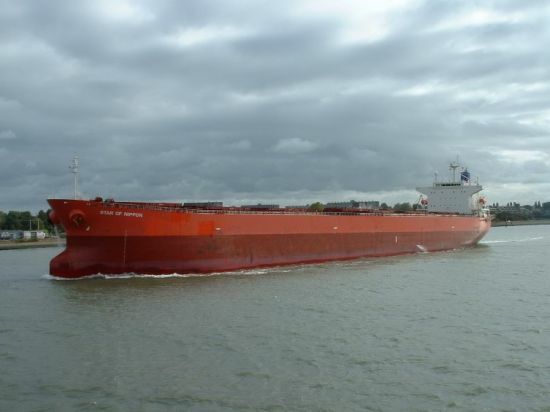 It took 29 days from Sasebo, Japan to the Panama Canal. It should have taken about 18 days. The ´weather service´ seemed to have routed us through every storm in the Pacific that month. These three photos show us proceeding in ´following´ seas after breaking out of one of the messes. second view in the sequence. Final view, with decks awash. This went on,--and on,-----and on. 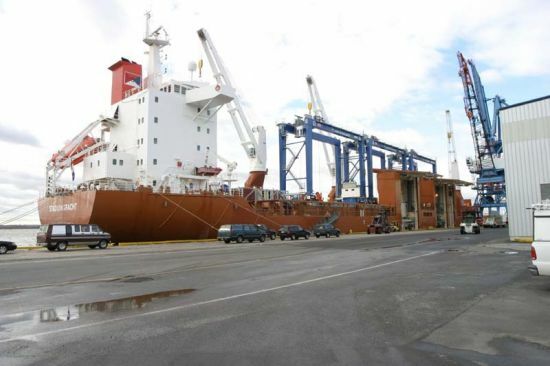 The cargo booms have been lowered and secured in their cradles for an ocean crossing. This is done for safety and to reduce wear and tear on the gear. Hatch battens would also be placed and secured at this time. 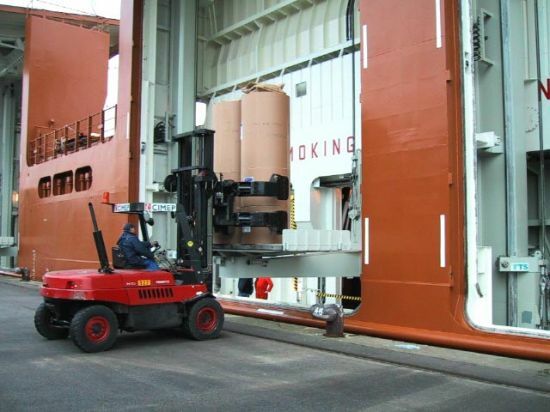 The cargo gear has been raised and prepared for discharge and loading of goods. One of each set will be swung out over the pier as the "yard boom",(a hold over term from a time when a block at the end of a sail yardarm would have been used), and the other would be centered over the hatch. 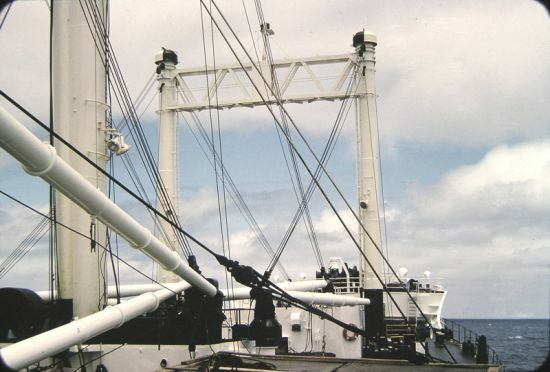 the ´whips´ would be connected together at the cargo hook and the winch operator would lift the cargo with one boom, shift it to the other boom using both winches and lower it with the second boom. Montevideo, Uruguay always gave me the idea of a time capsule. You could still see an occasional Model ´T´ Ford in regular use on the streets. 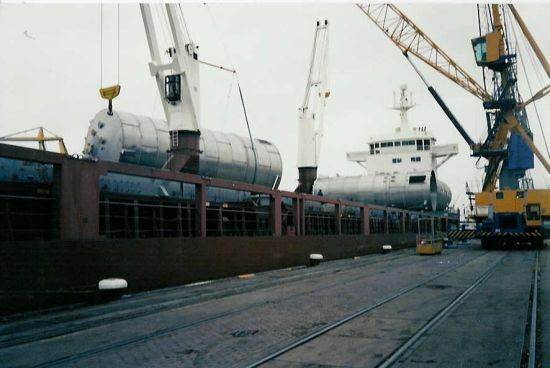 The import duties discouraged the import of vehicles so some were repaired over and over again. 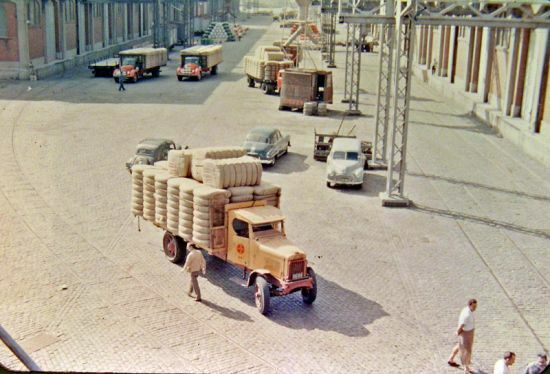 This truck from a ranch, delivered bales of wool one day. Look closely at the rear wheels and you will see that ´tires´ are actually solid rubber bonded to the metal wheel. 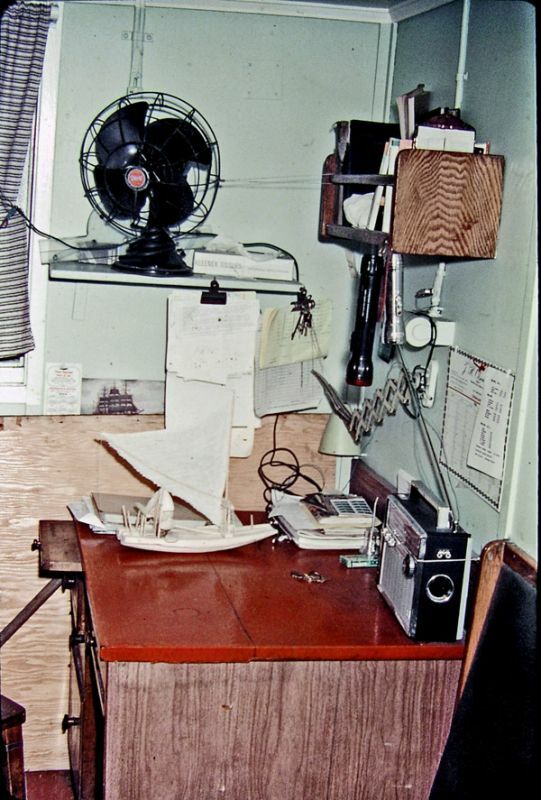 The desk in my cabin on the Mormacoak. Note the artful use of red paint and plastic shelf paper. I still have the radio. Note also the model of a JUNGADA. This shows the traditional log type of construction. Most are actually made of a closed box with similar lines. Imagine four fishermen going out for a day or two on one of these. Food was cooked over a fire built in a box of sand. This was a daily event. Varying numbers of these fishing boats would head out to sea each morning. The sails are mildew coated because they were kept wet to tighten the fabric for greater efficiency. 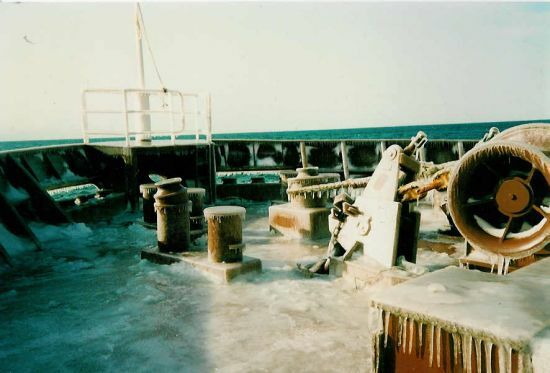 Most had a crew of four ´handline´ fishermen aboard and might stay out a couple of days. 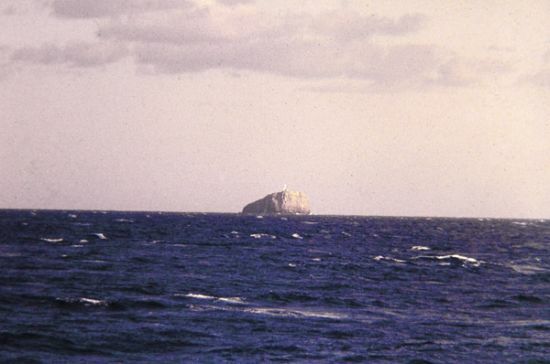 One was sailed all the way to "Rio" because they wanted to see what it looked like. I wish that I had saved the paper. Take a close look. 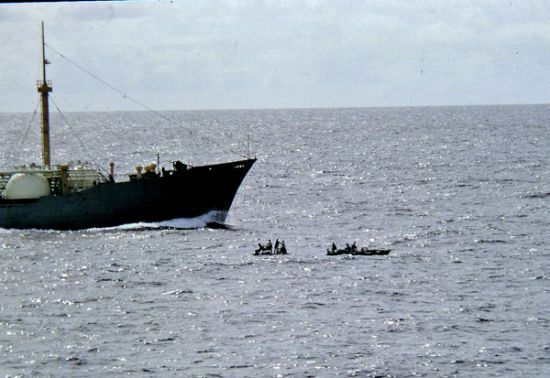 There are two boats/rafts of fishermen in this picture. I was often amazed to see these daring people well beyond sight of land, fishing. It gives me shivers to this day thinking about this lifestyle. 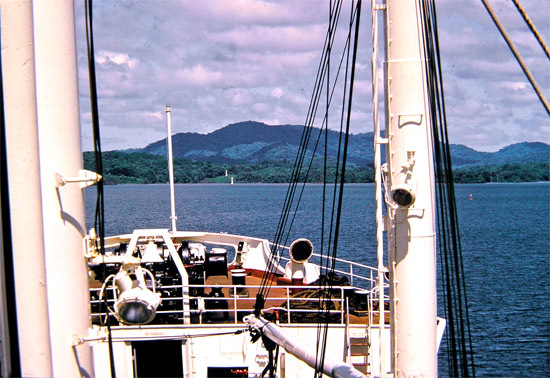 The Gaillard, or Culebra Cut once restricted traffic in the Panama Canal to "one way". It remained that way for about 50 years. In the ´60s it was widened to allow two way traffic. I was told that the geologic structure of the area is unstable, hence difficult to alter. 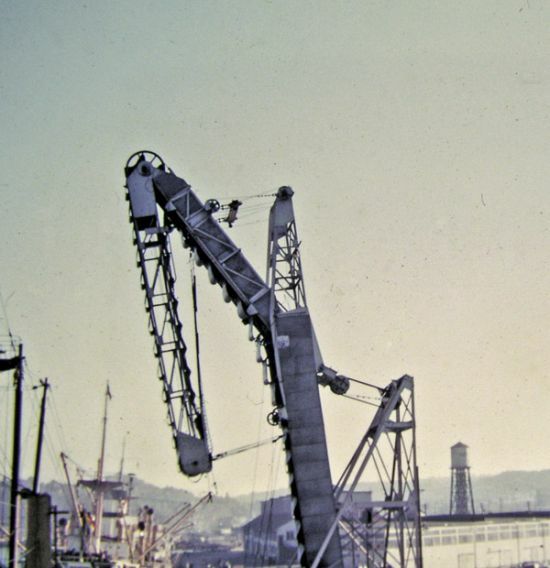 The steam bucket dredge in the picture may well be from the era when the canal opened. 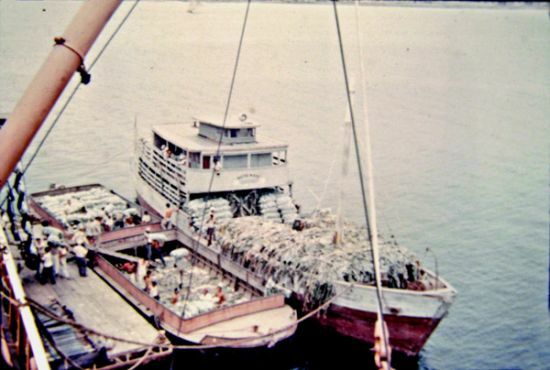 The "Mules" that controled ships in the locks of the Panama Canal for the first 50 years ran on low frequency AC current,(25 CPS comes to mind but may be wrong). 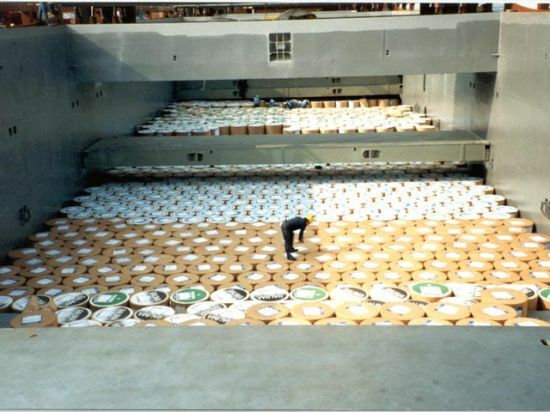 When Panama went over to higher frequency, these "Mules" could not be operated and were replaced with an improved model. 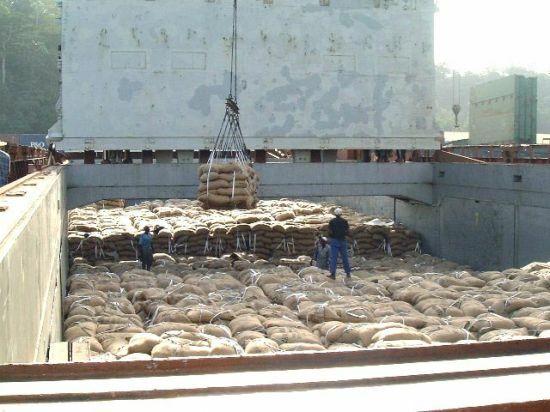 Bananas used to be shipped ´on the stem´. Today the ´hands´ are cut free and packed in boxes for shipping. 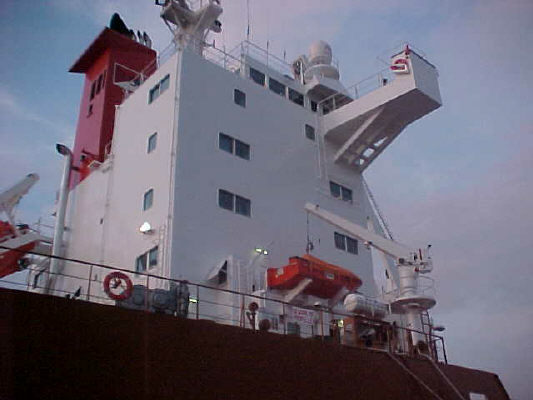 This large device would extend over the ship and down into the hatch. Men in the hold and on the shore would either shoulder a full ´stem´ and bring it to the moving pockets on the belt of the loader, or take it as it came off the belt. Four or five of these might be working on a single ship at once. This was at a United Fruit Company terminal. 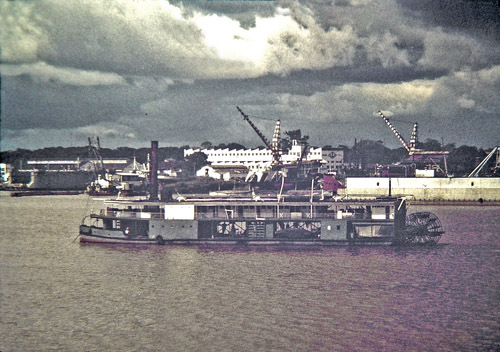 These boats/barges came down river from inland plantations. You can see the end of the "loader" over the work barge. 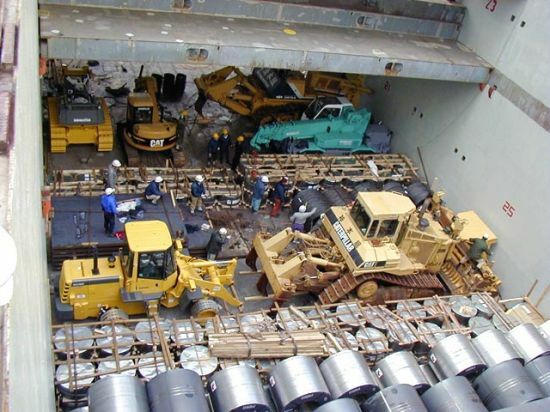 It was a very labor intensive operation as you can see by the number of longshoremen. The "stems" are sheathed in plastic bags after being given a "bug dunk" on the farm. The load is covered with leaves to slow ripening. The shore crew boss came to tell me that his gang did not want to work a hatch because of the bees. It sounded strange to me so I went out to look. 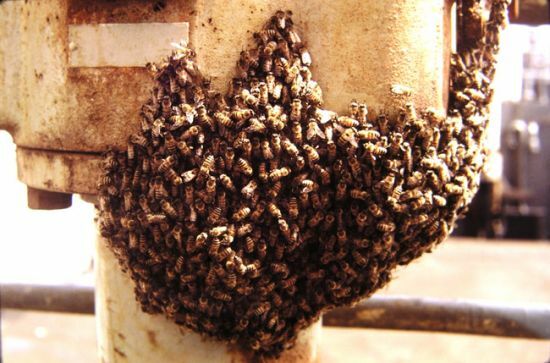 The winch controler stand was partially covered with this swarm. They had not made the popular news at that time, but they may very well have been "africanized". 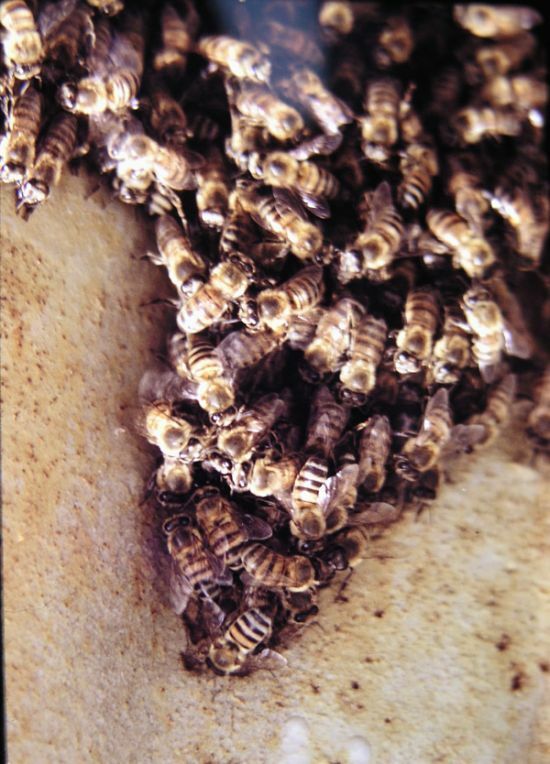 This is a section of the bee swarm shown in the prior photo. You can see the very distinct markings on them. They finally did what bee swarms do, and flew off after an hour or so. They were clustered around a queen seeking a new nesting site. When scouts came back, they were followed to a new spot. The sea is still warm in the fall while the air can be quite cold. 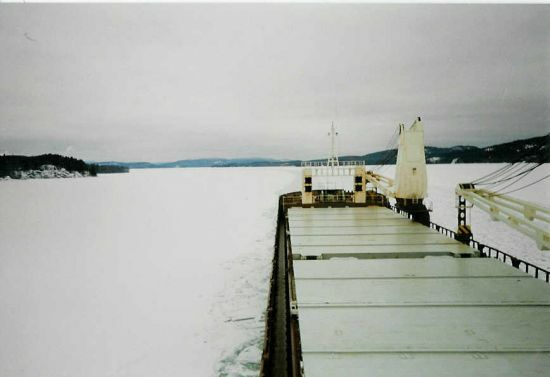 I believe this was taken en-route from Boston to Saint John, N. B. 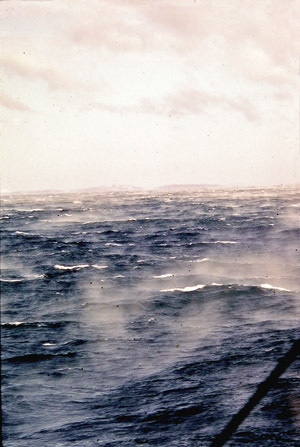 The wind blows across the water and is slightly warmed. Being warmer, it picks up moisture. It swirls back into the colder air, is re-chilled, and a moving, twisting mist is generated. It looks as if smoke were coming off the water. 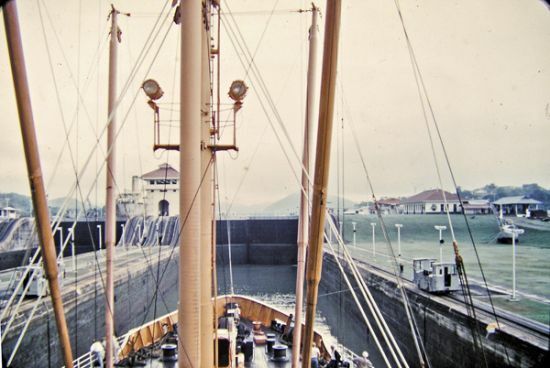 Larger vessels had to enter a "locked" basin at high tide. With the gates closed they could stay afloat at low tide. 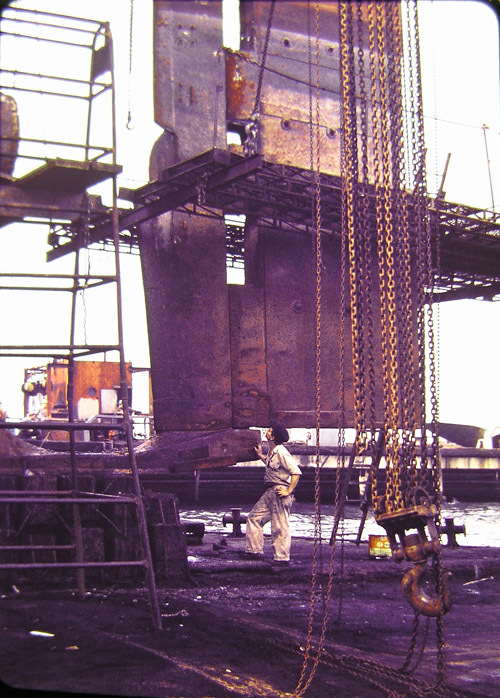 Barges and shallow draft lighters also had to be locked in with them for cargo work each day. Some are visible. I was standing the 4-8 watch waiting to work cargo and got this picture during the lull before a busy day. 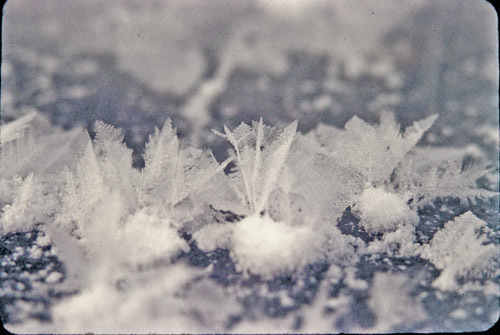 These crystals form on raw ice during very cold nights when there is ample water vapor. I found them in the early morning on a lake, and got out the camera before the sun could hit them. They are about three quarters of an inch high. It has been many years since I took this photo, but, because it has reasonable depth of field, I expect that I used a 3.5X telephoto lens with a thin extension tube behind it. The Captain decided to give the passengers a show and went along the coast. He got a bonus when a small squall gave us this scene. It is going to rain! 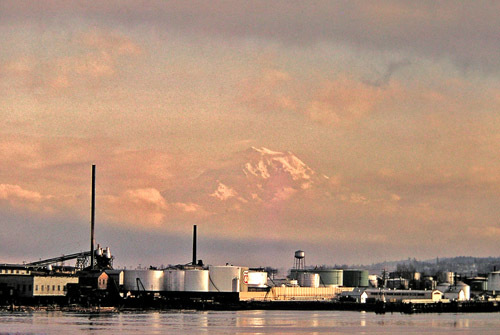 I was told the when you can not see Mount Rainier, that it is raining. I was then told that if you could see Mount Rainier, that it was about to rain. There is more than a grain of truth to the remarks. When I saw the mountain hanging above the clouds, (rain), I took this picture. It is impressive, (when visible). 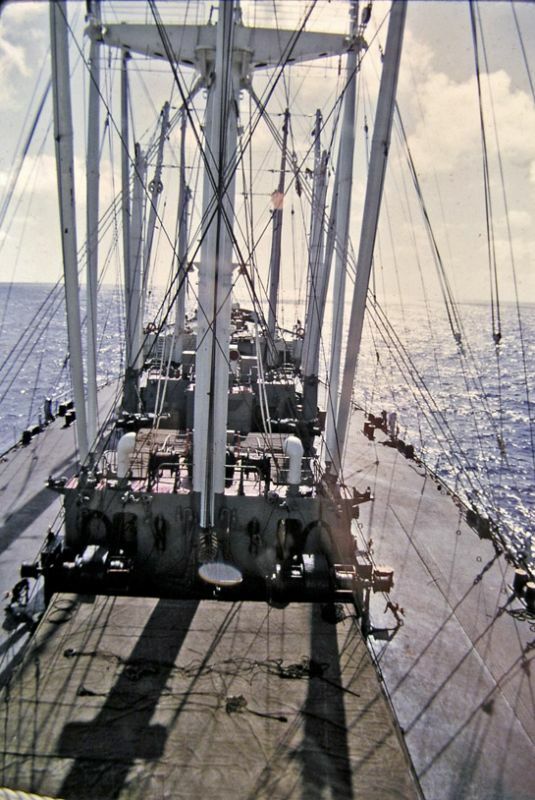 This is an impressive view of the bow of a C-3 class vessel. 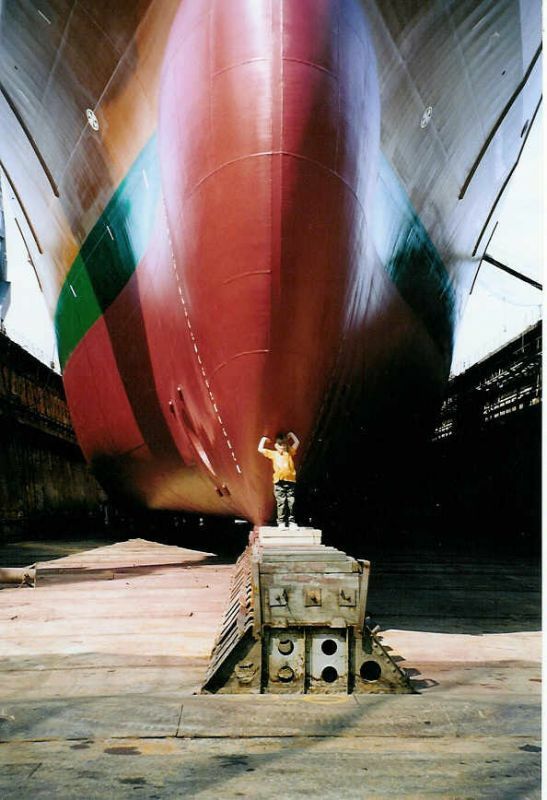 You can see the keel blocks and sides of the drydock and the anchor chains "ranged out" for inspection. Each link was struck with a hammer to detect the dull sound of hidden cracks. I think that I used a low powered wide-angle lens for this shot. 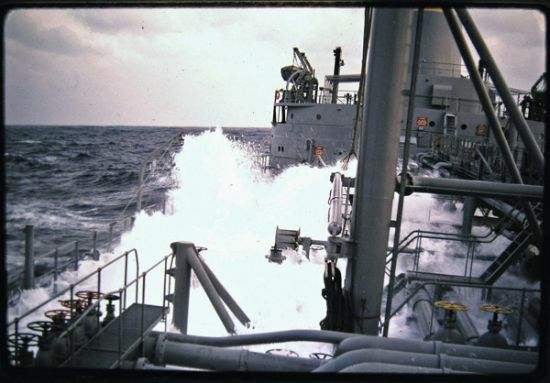 This is the stern of a C-3 class vessel. The "wheel" has been removed for replacement. The "boss" where the shaft passes through is just visible on the left. 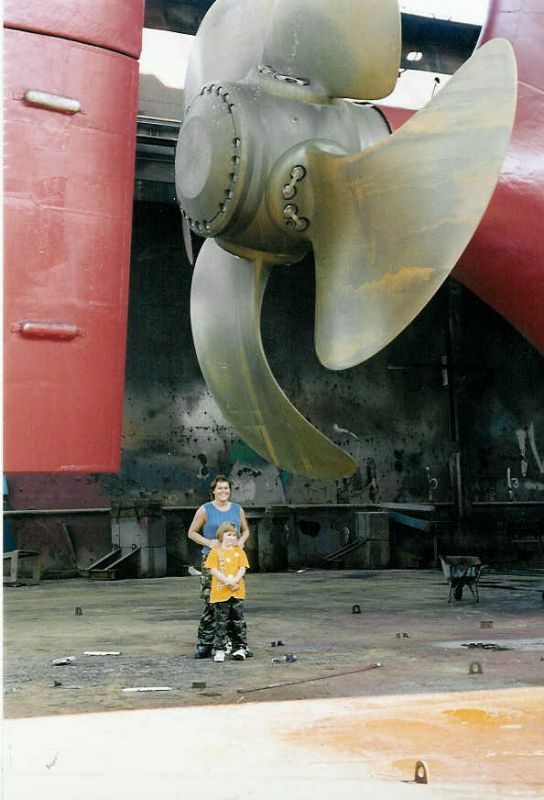 The Third Engineer is standing next to the "skeg" which positions the lower end of the rudder. A close look will reveal that upper and lower parts of the rudder have slightly different angles. This is because the blades of the "wheel" are going in opposite directions as they pass it top and bottom. This compensates for the difference in the water flow at each position. As I recall, the "pitch" of the blades was 19 feet 6 inches per revolution, and at sea it turned at a bit over 70 RPM. Typical speed was a bit over 16.5 knots. You never know what you will see on the Amazon River. Even the century may seem out of joint. We passed this boat anchored, but ready to go. 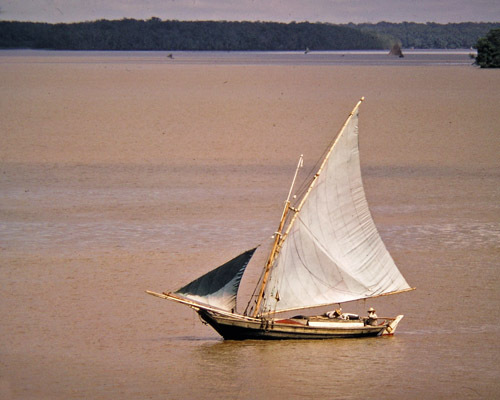 I imagine that boats like this may well go to the head of navigation at Manaus or perhaps beyond. The slide gave me a bit of a problem as the day was dull and gloomy, but I wanted to let people see it. In a way, this one looks like it might belong in the Middle East. The Amazon is home to a great variety of craft. One of the crew is taking a nap on the house. Most of these boats provided a living for people. Leisure craft were just not around when I was there. There is a shadow of a doubt about this boat. I am 90 percent sure that it was in Bahia Brazil. It is not in the Amazon. The slides around it are wrong for that and the water is too clean. 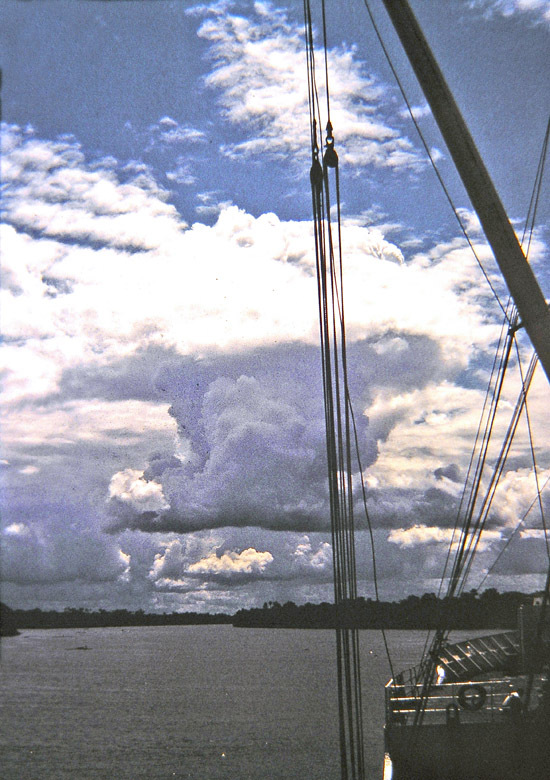 Notice that the mast is actually a rough cut tree trunk, and the foresail is bound around some sort of a wooden boom. Bahia is built on the cliffs that surround a bay. There is a very narrow area at the waters edge. If you want to go to town you first have to get up there. 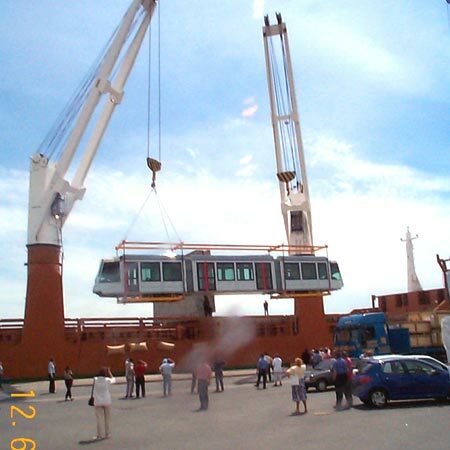 This cable car was the method used. As I remember, it was a balanced system with one car going up while the opposite one came down. It was an interesting ride. A similar, but newer, system is at Niagra Falls. We were headed to the coffee piers at Santos ,Brazil. The booms had been rigged out, and were ready to be swung into working position. The battens were off the hatch tarps and are laying near the rail. The crew has not been called to docking stations but there is one member at the rail watching the world go by. This cloud stood out so clearly from everything around it that I took its picture. The light in the tropics can be very tricky, especially near mid-day. It is hard to judge the proper exposure for wide scenes. This turned out simewhat under exposed. I feel that it has a bit too much grain after being re-worked. There are times at sea when you can get somewhat poetic. There is so much beauty in even the most common of things that you can get a little carried away. Here is the picture of a cloud bank in the late afternoon. 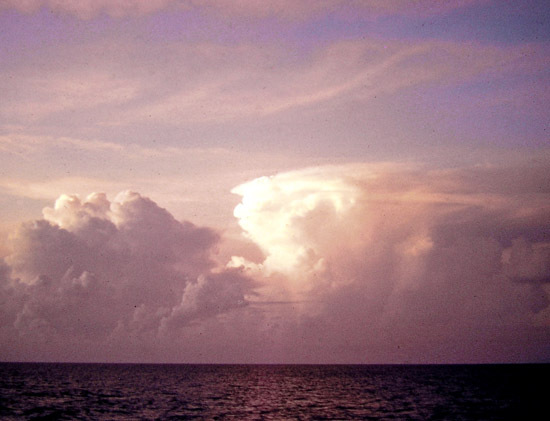 the sunlight caught the upper part of a tall cumulonimbus that seemed to have the shape of a profile. I like to think it may be the personification of the essence of the storm. 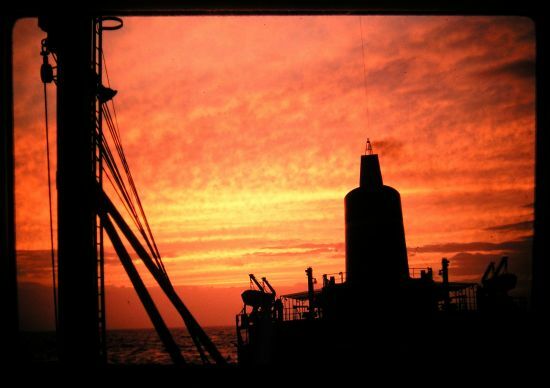 We were on a petroleum run to the Persian Gulf at just the right time astronomically. 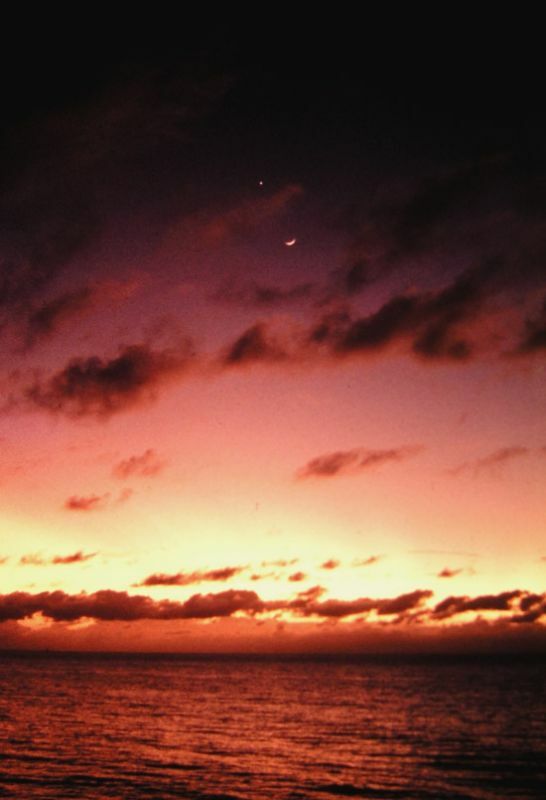 Venus and the Moon made a special sight that I could not pass up. There was a similar pairing in 2005, but this one was about 42 years ago. I suppose it could be looked up and the actual date range determined. This was too good a frame to miss. 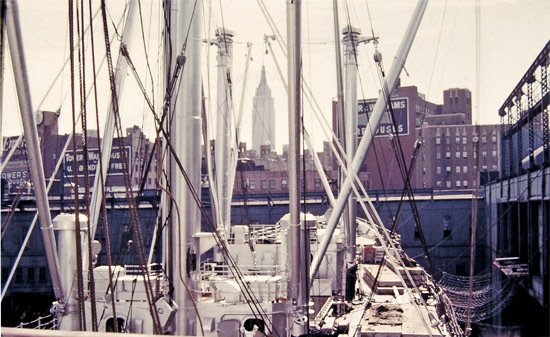 I think that it is at a U. S. Lines pier on the Hudson River in the spring of 1962. 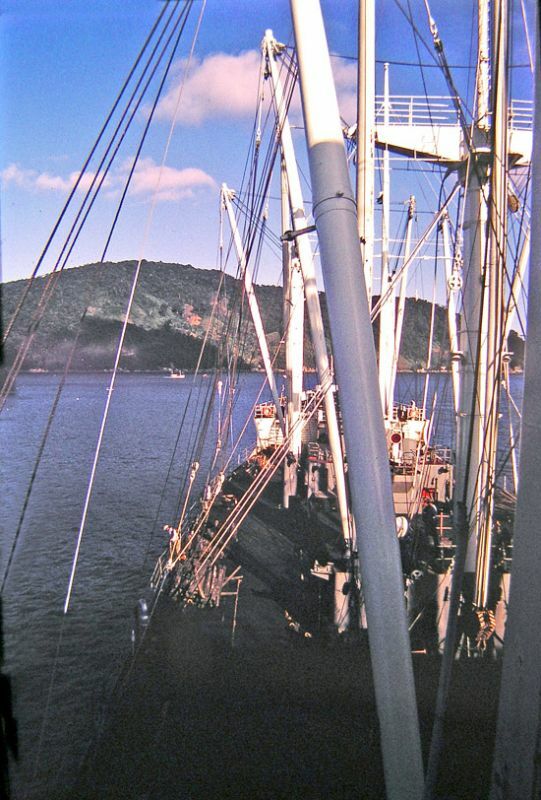 Notice the nets strung between the pier and the ship at the turn of the bow near #1 hatch. Any cargo that fell out of a sling would fall into the water and be lost without them. The slide is suffering from age fade, but I managed to brighten it up a little. Morning brought the sight of new snow that had drifted up to the level of the hatches. The longshoremen would not work the ship until it had been cleared. 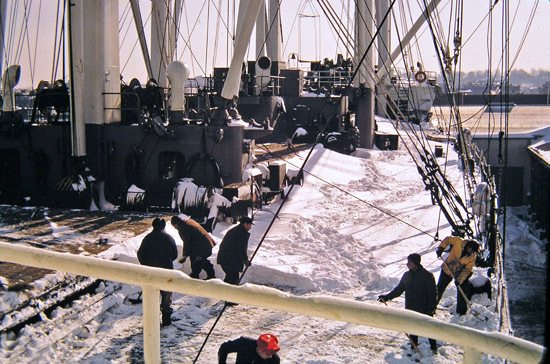 It took the efforts of some crew members, on overtime, and a cleaning crew to get enough of it thrown over the side to start cargo operations. 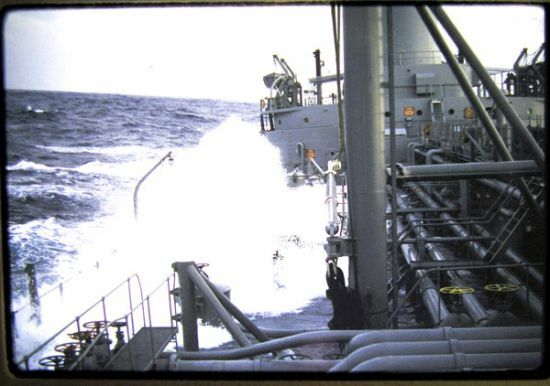 The wind had actually been strong enough to keep the amounts low over a lot of the ship. 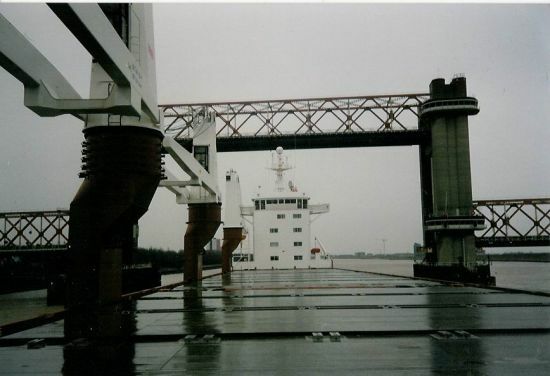 Here are a set of ranges that allows the pilot to keep a ship lined up in the channel. You can see that there is a buoy just to the right of the kingpost. This marks a turn point in the channel. 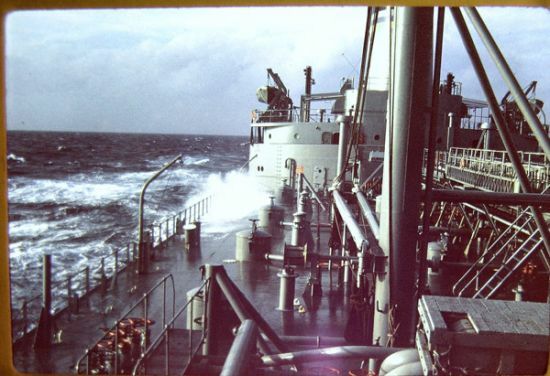 The ship was about to be turned to starboard to line up with another set of range markers. On this passage, unlike under most passages, the pilot has full con of the vessel. The location is in Central America. 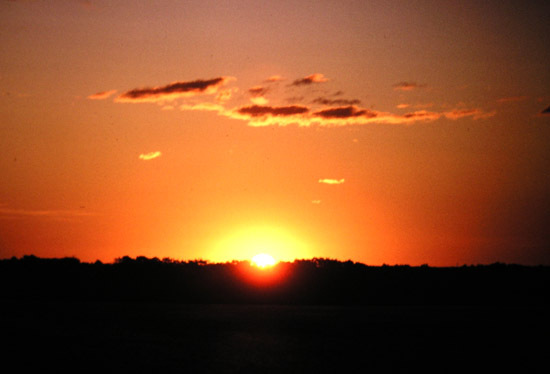 The Lake is named Gatun and is an artificial impoundment. What is the rest of the story? 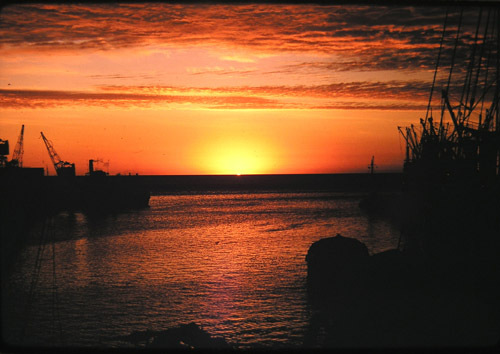 Seafaring people have the opportunity to see sunsets in a way that is missing for most people. While it is possible to start to take them for granted, really nice ones still catch your attention. 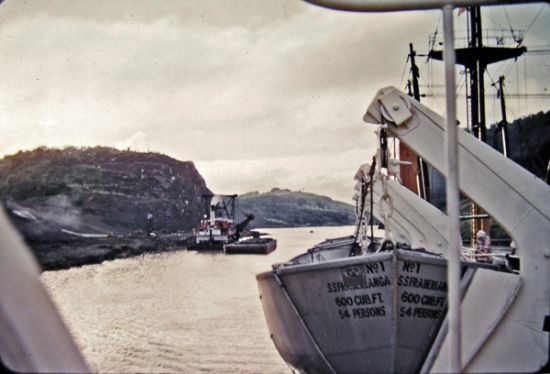 I think that this one was taken along the waterway that is the approach to the port of Paranagua, Brazil. I could be very wrong, but it is no less impressive. 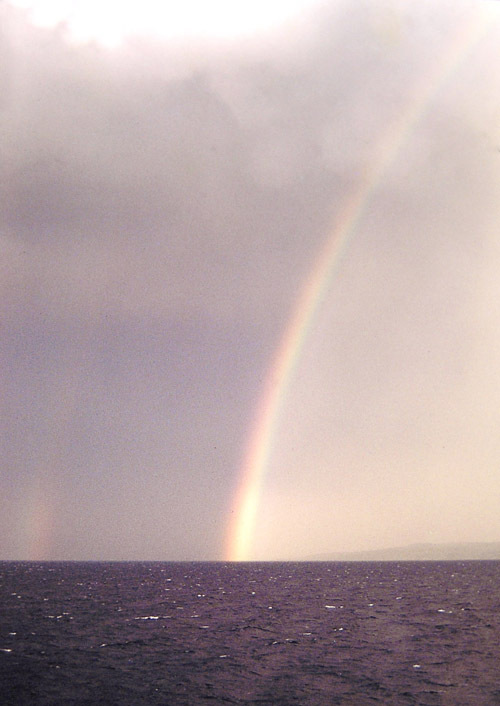 Here is a picture that I took on a rainy day while a Cadet on the S. S. Robin Hood. Missing from the photo are a couple of Zulu Warriors in full regalia with rickshaws. They had a regular business of giving rides to tourists for a moderate fee. It was actually a pretty exciting ride because they get up to a good run and slide back on the shafts. The cart would tip back and they would come off the ground giving the rider quite an unexpected experience. See the next photo for more details. 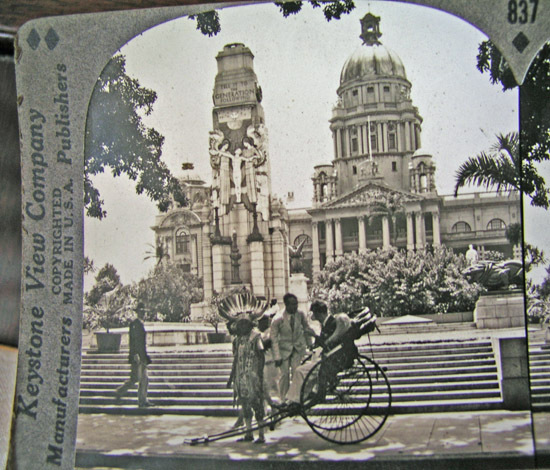 As you can see, this is one half of a slide from a Victorian 3-D viewer. 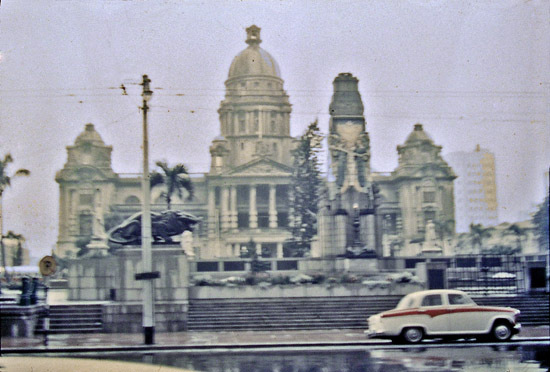 The angle is a bit different, but you can see that the building and monument had not changed much in half a century. This one also shows a warrior with a rickshaw like the one described in the previous photo. I would imagine, unless some ordinance now prevents it, that you could still get a rickshaw ride in front of the Town Hall. The power lines seem to be missing in this photo, but it may be because the angle was chosen to omit them. 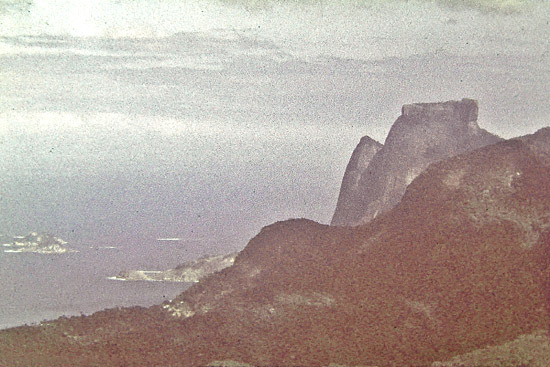 This is a view of Sugar Loaf as seen from the viewing platform of the statue of Christo Redentor on Hunchback Mountain. 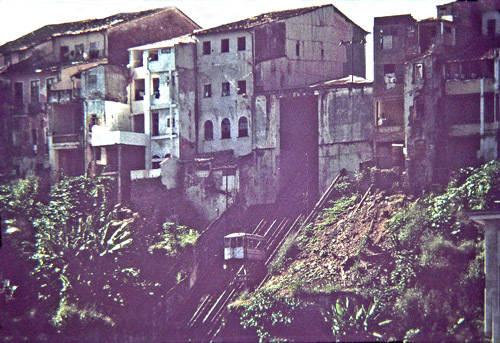 As a Cadet, I had hired a taxi for the day to see the sights around "Rio" and go to the mountain top. It cost nearly every cent that I had at the time, about $20. In 1961 that was a lot. I was never sorry that I did it. When in Rio, look up toward the mountains and you will see the statue standing out against the sky. 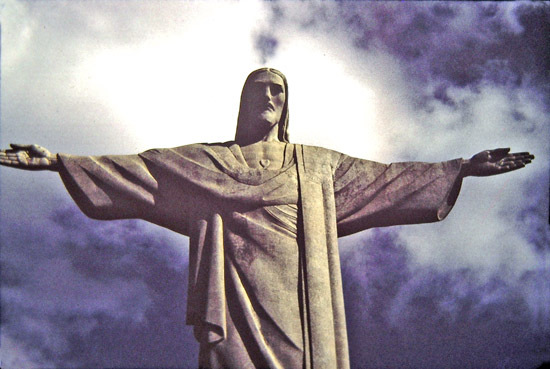 This is a picture of the impressive statue that overlooks Rio. It stands out above the city and looks like a cross etched into the sky. It is more impressive than the more famous Sugar Loaf but is not seen in as many city guides. I went to the base of it via taxi, but there was a small lift train that also went to the top. It has been many years, but I imagine that the lift still exists. It is worth the trip, both to see the true size of the statue, and to see the wonderful views of the whole area of the city and Guanabara Bay. 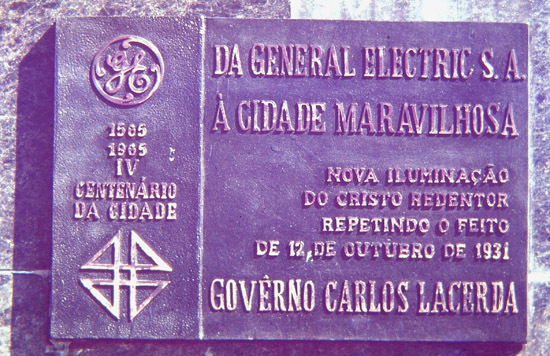 This plaque was placed at the base of the statue by GE SA. It would seem the company installed new lighting for the four hundred year anniversary of the city in 1931. Thiry years later it was still working well and the statue was even more impressive at night. 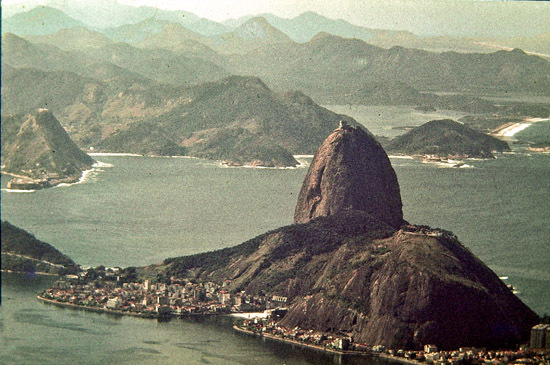 Because of its placement, it can be seen from much of the city of Rio. Guanabara bay and the city of ´RIO´ is surrounded by some very impressive landscape. Most of the photos show beaches and the Sugar Loaf. It is really much more scenic than that. Photography is a huge tourist activity in Japan. I joined in on occasion by having a picture taken at famous spots. 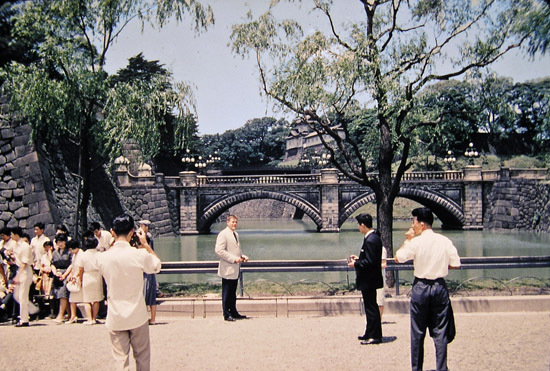 In this case it was the area in front of the moat and bridge that leads to the gate house for the imperial palace. It is about the only part of the complex that a tourist can get to see. You can see how long ago it was by the way I was dressed and how young I looked. More recent pictures that I have seen show little change after some forty years. I hunched down to get a good view of the interior of the crater of the volcano. This was taken fairly early in the morning because the crater fills with clouds most of the day. 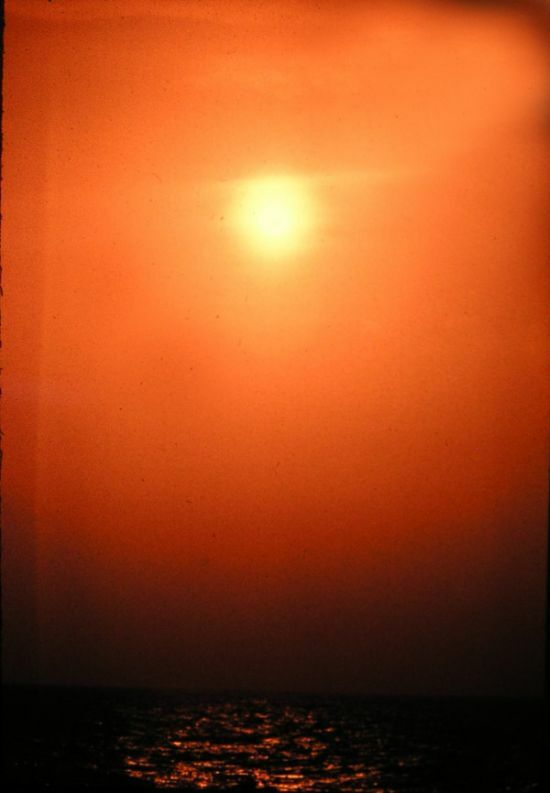 The trade winds blow moist air in and clouds form soon after the sun warms the ground. Less than an hour after this picture was taken the whole crater was obscured. 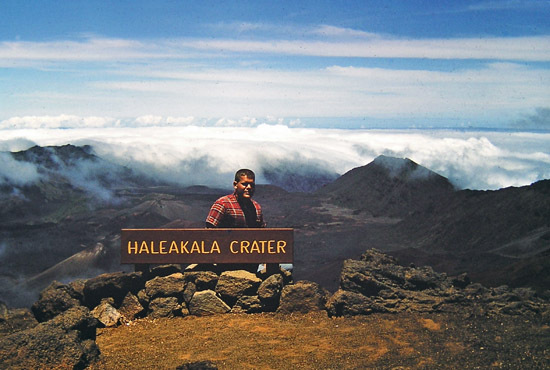 If you get the chance to go to Maui and see Haleakala Crater keep this in mind when making your plans. 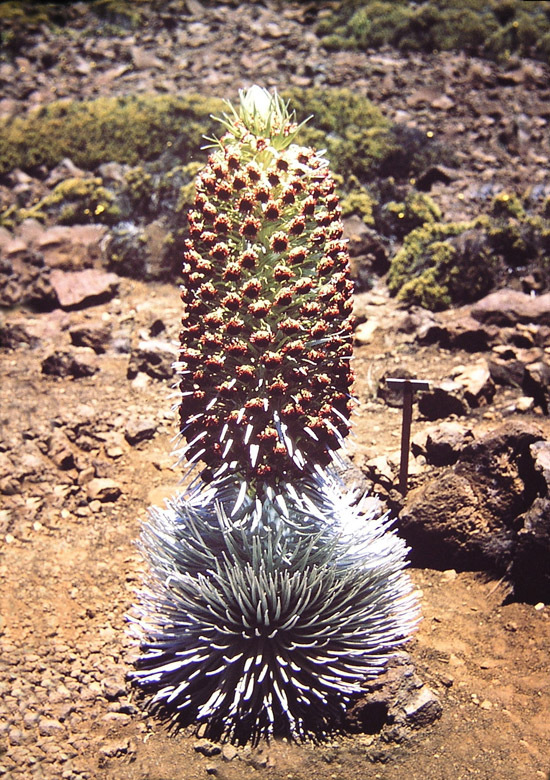 These spectacular plants only grow in the volcanic soil high up on the mountains of Hawaii. They are actually related to the sunflower. They grow for several years before they have a single blooming cycle and die. I stand over six feet tall and this plant touched my arm when I held it straight out. It was a prime example of the plant. I was lucky to see it as its location was not given at the ranger station, only several smaller ones. I think that they did not want it to get too much traffic. I found it because I went wandering around on the side paths at the site and came upon it. As Requested by our users. 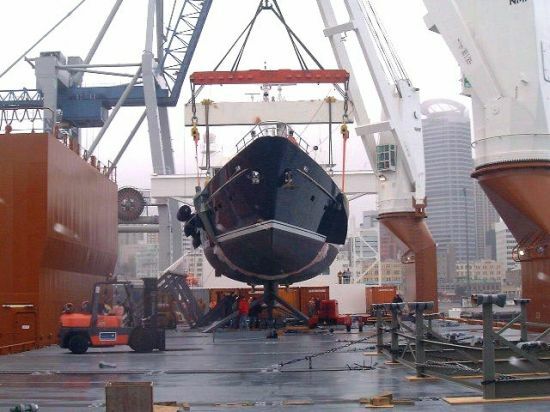 One of our jobs is to ship sailing- and motor yachts. 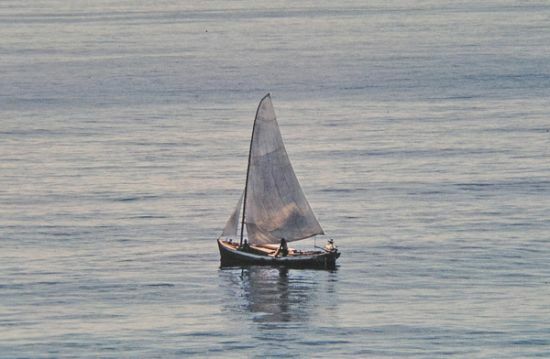 People like to sail in the caribean or mediterranean sea , but don´t want to sail all the way to the destination. We take care of that part of the job. As we transport a lot of forrest products , we have to load often in wintercountries like Finland , Sweden and Canada. 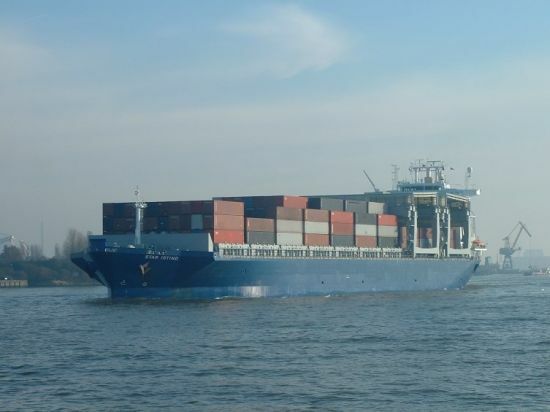 A lot of paper is shipped every month again from Finland to USA. 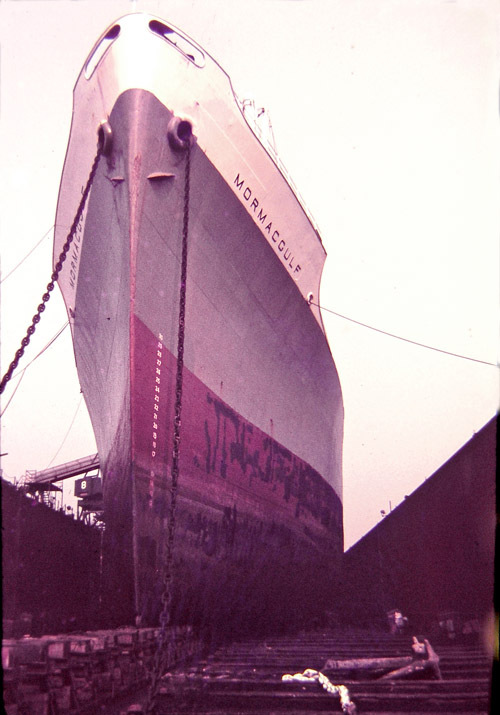 The m.v.Spaarnegracht in the drydock in Rotterdam. My wife(Irene) and daughter(Nanouchka) in front on the dockfloor.